As for the committee’s deliberations on the agenda item recommending cancellation of the city’s Drought Level 2 declaration, the request was simple enough: rescind the declaration and its water use restrictions. The most noticeable effect of a cancelled drought alert would be elimination of the 3-day-per-week 10-minute-per-station landscape sprinkling rule. There would be no effect on the relaxed restrictions that were made permanent by ordinance at the city council on Nov 9, 2010 (curiously the city’s press release on that ordinance was entitled “City strengthens water use restrictions“). Councilmember Carl DeMaio almost derailed the whole discussion by trying to introduce changes to rules already contained in the city ordinance (he thought maybe we should allow landscape sprinklers to water every day but be limited to 10-minutes per day, among other ideas). Councilmember Sherri Lightner set him back on track by pointing out that making changes to the water ordinance can’t be proposed as part of this agenda item, it requires separate public noticing, etc. Public Utilites Department assistant director Alex Ruiz pointed out that all other regional water agencies have or soon will have cancelled their own drought alerts and that it would be awkward for San Diego to not do the same. Councilmember Lorie Zapf talked about the need to promote a “water ethic” in the community and the possibility that rescinding the drought declaration would be as good as signaling “all clear” and wipe out the progress made in getting residents to conserve water over the last few years. This was rich coming from the committee that just a few months ago voted against stronger Drought Level 2 restrictions being made permanent regardless of drought status (here’s my report on that mess). In the end, the committee moved to send the drought alert cancellation to the city council and to pursue changes to the city ordinance separately. I see 10News already has a story out. 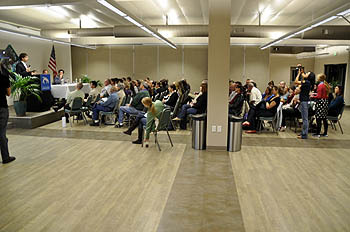 “Signs of the tide — San Diego’s water supply” was the title of an interactive panel discussion hosted by San Diego Coastkeeper yesterday evening at the Urban Corps of San Diego County facility in the Midway area. Panelists were David Pierce, Analyst, Scripps Institution of Oceanography; Jared Criscuolo, Co-founder, Below the Surface; Bruce Reznik, Advocate, San Diego Coastkeeper; and Brook Sarson, Owner, H2Ome, and the moderator was Rob Davis, Senior Writer, Voice of San Diego. 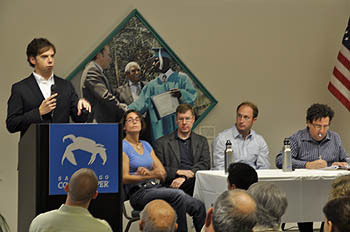 From left: Rob Davis, Brook Sarson, David Pierce, Jared Criscuolo, Bruce Reznik. Next, Jared Criscuolo showed slides from his group’s “Spring to Sandtrap” canoe expedition to explore the headwaters of the Sacramento River through the State Water Project to the sprinklers at a Southern California golf course (the shot of that looked like it might be Palm Springs). He said that they had intended to but didn’t actually canoe through the SWP aqueduct because it was dangerous and also prohibited (someone behind me whispered “they better not have…that’s drinking water!”). The expedition documented how relatively pristine water conditions near the headwaters rapidly deteriorated as they went downstream where they encountered numerous facilities drawing water on the one hand and expelling wastewater on the other, with water becoming murkier and algae growth more prominent as they continued their journey. Finally, Brook Sarson covered rainwater harvest, stormwater redirection, and greywater reuse design and cost issues. She talked about the mindset people have about getting water away from the house and property and the desirability of finding ways to redirect it into the local soil. She also covered practical issues with greywater use, noting that it’s a bit more involved because it often requires a permit, can’t be stored for longer than 24 hours, and can only be used on certain types of plants. She displayed slides from some the rainwater harvest projects she has installed locally through her H2Ome business. Overall impression: a worthwhile informative gathering, but while turnout was probably around 100, most appeared to be people already well-schooled in water issues. I think the hope was to address more newbies who would be learning something new but I’m sure the organizers were gratified to see so many well-informed people coming together for this event. Prior to starting we were treated to a light dinner of pizza and ice tea. Dylan Edwards from Coastkeeper did the welcome and closing remarks. The moderator Rob Davis gave a brief introduction to each panelist and fielded questions turned in from the audience on paper slips during the discussion. One of the sponsors, San Diego Gas & Electric, had a small booth with pamphlets and information about the Smart Meter program. I was told slides from the PowerPoint presentations will be made available by Coastkeeper, and I’ll add a link to them here when they’re available. The North County Times filed this report on the meeting. San Diego Coastkeeper also did some live tweeting from the event. …and so does the OB Rag. If you’re not a big fan of online news media, you probably haven’t heard that our own Voice of San Diego just turned five years old. In an age where we read about the dinosaurs of the old media dying daily, our home town of San Diego hosts one of the bright shining lights of what many consider the future of news reportage. As part of their recent website redesigns, the San Diego Union-Tribune and the Voice of San Diego implemented a new system for naming URLs for their stories. My experience is that U-T’s site has problems redirecting users trying to access legacy URLs. The Voice also has a minor issue with that, as well as difficulty with its calendar. Legacy URLs are the original URLs for older stories that appeared on the previous website. Without a redirect from the legacy link to the new URL, the result is a “404 Page Not Found” error message. “Page Not Found” is bad for the user and bad for a website. The frustrated user may not be inclined to do extra digging to find the article; instead, (s)he may abandon the search and go elsewhere. I checked some of my old blog posts that cited articles in the Union-Tribune, and many of them led to a 404 error. When I reported the problem to the U-T, they told me I should change the “www” to “legacy” on the bad links. The U-T said they are working to get redirects operational. I think those links shouldn’t have broken in the first place. Not ensuring functional automatic redirects before implementing a new website suggests haste in getting the new product out. As of today, I’m still getting those 404 errors. The Voice of San Diego for the most part seems to have redirection working though I did encounter a dead link the other day. They indicated to me they are still working on the issue. For a while their calendar wasn’t working. Although it’s up now, it contains very little information and calendar navigation is messy and difficult to use. They’re not alone in that though–I think event calendars just inherently defy good design and perhaps website owners don’t think they’re worth the trouble. One thing is sure–calendar widgets on the cheap aren’t going to get you very much. The U-T also has problems with their search function. For a few days after the new site rolled out, my search for “Sanders budget” turned up no hits at all for 2009 and almost all searches failed to sort results by date correctly. The date sorting problem seems to be fixed now, but the search utility still does a poor job of locating documents. Today, the “Sanders budget” search on U-T’s site listed only 6 documents for all of 2009. The same search on Google gets 91 documents–for the last month alone (site-specific searching is available on Google as an advanced option). It makes me reluctant to use U-T’s search at all. 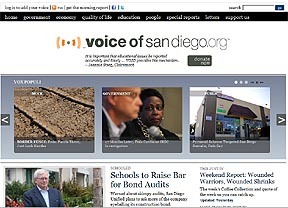 The Voice of San Diego redesign is still morphing. Sunday morning’s home page devoted a huge chunk of space at the top to a marquee slideshow, a technique I consider superfluous. By afternoon the slideshow was near the bottom of the page, visible only after scrolling down. The Union-Tribune allocates a generous amount of screentop real estate to advertising, some animated, also an unwelcome distraction in the way it competes with the news. 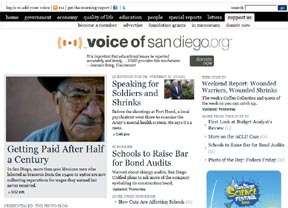 A major change in Voice of San Diego’s site was to enable comments on all individual articles, but unlike the U-T, anonymous comments are not permitted. While the U-T requires commenters to sign in through Disqus, Facebook, Twitter, or OpenID, it’s still easy to maintain anonymity. On Voice of San Diego you can use a pseudonym for your comment display name but your profile page will show your real name. The reaction I’ve seen to the policy against anonymous comments has been supportive because having to reveal one’s identity encourages responsible discourse. Overall I’d say the changes to both websites represent an incremental improvement in appearance and functionality but there’s still lots of room for improvement. As for their journalism and editorial direction, I guess my opinion leaks out between the lines on some of my other blog posts from time to time! The Equinox Center, co-hosting the forum, also contributed this Primer on Water Pricing in the San Diego Region for the discussion. This looks to be an interesting conversation to follow during the week. Voice of San Diego and the Equinox Center are doing a great public service with this.